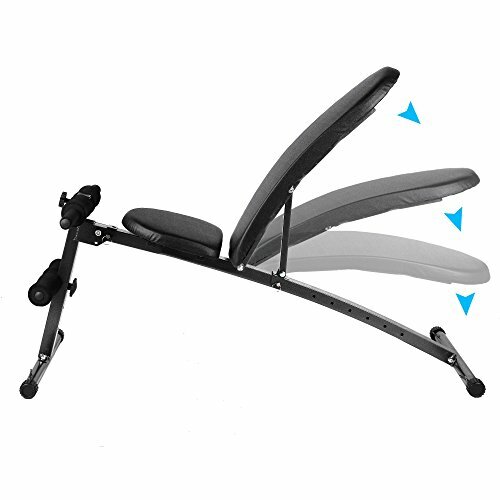 ★Fitness bench has 4 adjustable positions. ★Dumbbell holder offers easy access to weights. ★You can set upright, flat, incline, and decline. ★ Great item! I use it for my fitness workout at home. Very easy to handle! And very effective training. ★I love it, it is very compact and great weight capacity. 1.As Different Computers Display Colors Differently, the Color of the Actual Item May Vary Slightly from the Above Images. We Guarantee the Style is the Same as Shown in the Pictures. Thanks for Your Understanding. 2.If You Are Not Satisfied with Our Products, Please Let Us Know. We Will Solve any Problem for You at Any Time. Your Satisfaction is Our Main Priority. ★Keep Away from Children to Avoid Danger!